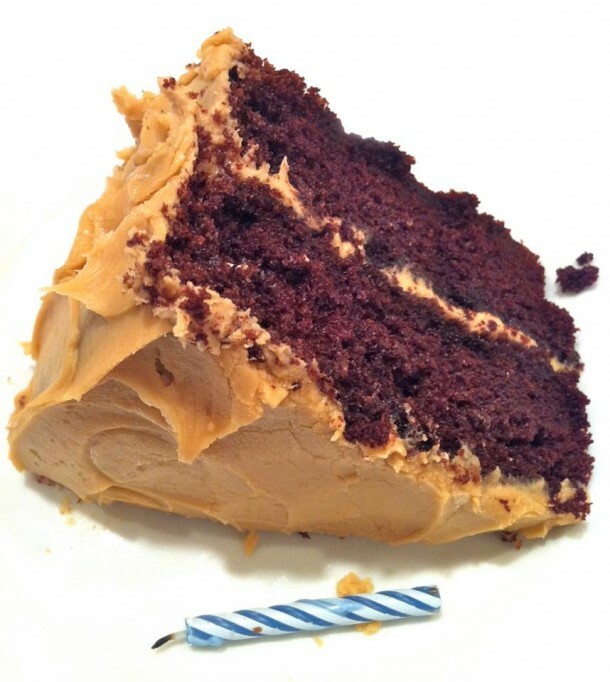 Caramel frosting on a chocolate cake has always been my mother-in-law’s preferred birthday dessert. Caramel frosting on a spice cake has long been my dad’s favorite treat. So, over the years, I have had many occasions to try various recipes, and this recipe for caramel frosting always brings rave reviews. It’s the only one I make any more. Do not let the words “candy thermometer” scare you off. For years, I avoided recipes that required this tool, only to find it is so easy to use and makes for a perfect finished product. If you don’t have a candy thermometer, the baking aisle of your grocery store probably carries an inexpensive one. You will want a thermometer that clips onto the side of the pan. Click HERE for the recipe for delicious, one-bowl, chocolate cake perfection! 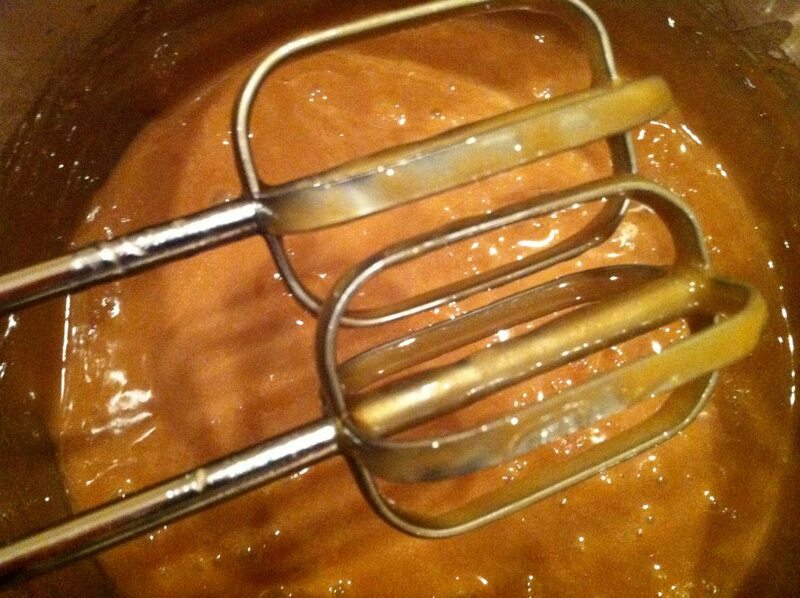 In a heavy saucepan, cook sugar and cream over medium heat until mixture begins to simmer. Cover, reduce heat to low, and simmer for two minutes. Uncover and cook, stirring occasionally, until the temperature on the candy thermometer reaches 238 degrees. Store in a container until ready to use, placing plastic wrap directly against surface. Keep at room temperature for up to one week or in the refrigerator for up to three weeks. If refrigerated, bring to room temperature and stir prior to frosting your cake. This recipe will make about three cups, plenty to frost a two-layer cake. I like to decorate the top with caramel Hershey’s Kisses as a clever tie-in to the cake recipe. This is a revised version of a Joy of Cooking recipe. Hi Tina, That idea never occurred to me, but I like the way you think! German chocolate cake frosting tends to be slightly gooier than this one, so it would likely be delicious, if not totally traditional. I’m attaching a link to a basic German chocolate cake frosting recipe that might serve as a good framework in terms of those additions if you decide to try…and if you do, I’d love to hear how you make out!